Compare between various Property Loans and make a Loan Enquiry today. 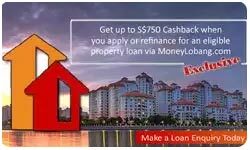 Property Loan Promotion is only avaliable to eligible customers who submit a loan enquiry on MoneyLobang.com and is successfully referred for a property loan at a qualifying bank by "Money Lobang Pte Ltd" or "Keyquest Ventures Pte Ltd". (i) he/she successfully applies and receives approval for a property loan that has a minimum amount of S$300,000 via our referral at a qualifying bank. (i) they are seeking to reprice their property loan at their current bank. For example, an existing DBS home loan client that wants to refinance or sign up for another DBS home loan will not qualify for this promotion. (ii) they are incapacitated, deceased, insolvent or have legal proceedings of any nature instituted against them at anytime during the application for propery loan. Casback earned from this promotion is non-transferable, non-assignable and non-exchangeable for any other item or purpose. Money Lobang Ptd Ltd reserves the right to change or revoke the cashback at any signs of fraud, abuse or suspicious activity. Money Lobang Ptd Ltd will not be liable to compensate any customers for any losses, expenses or claims resulting from the taking up of property loans with any financial institutions. Any dispute with the financial institutions should be resolved directly with them. Money Lobang Ptd Ltd and its associate Keyquest Ventures Pte Ltd are acting as neutral third party referrers to financial instituitions for property loans and are in no way related to any financial institutions. We may give our advice and suggestions to customers with regards to the property loan but it is up to each customer's discretion to follow or act on the advice or suggestion. 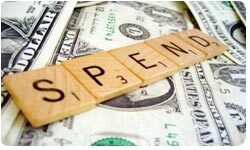 Money Lobang Ptd Ltd reserves the right to amend, delete or add on to any Terms and Conditions, including but not limited to amending the Promotion Period or amount of cashback, terminating the Promotion at any time without giving any reason or prior notice or assuming any liability. We shall not be liable for any claims, costs, expenses, losses or damages suffered as a result.